Powers/Abilities: Unknown - from the picture he can fire energy bolts from his hands. Presumably he can fly through space under his own power. History: It is the future...1983...and Captain James L. Hunt sets out on a one way journey into space. Disaster strikes when he crashes into another ship manned by a lone "Bionaut" called Astron. Somehow the accident merges both beings into one gestalt entity. With two minds now inhabiting one superpowered form, they return to Earth, where as Astron Star Soldier he/they defend the planet from space villains. Comments: Thanks to Paul Muir for providing everything I know about this character, as well as the image on this page. 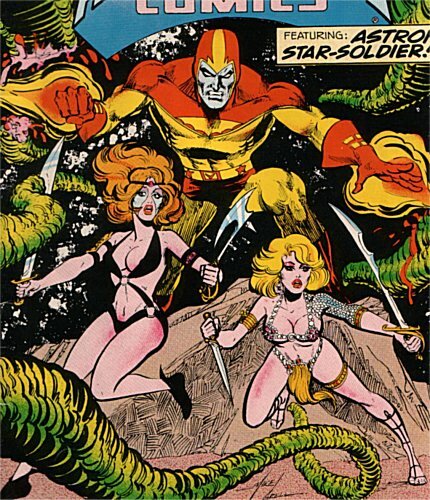 He notes that "Astron Star Solider was published in 1977 by Tom Siacca Publications (California). The book he appeared in was called Astral Comics - colour cover and black and white interior art - it looked like a fanzine in some respects but was a proper magazine with art by Tex Blaisdell, Rich Buckler and others. The cover (above) was by Mike Grell." He also mentioned that Astron's merged creation was "2 souls trapped in one sentient being - i.e. Capt Marvel type stuff, Captain Hunt's essense in the Bionaut hero".